For many beginning musicians, the piano is the first instrument learned. If you ask a professional oboe player, trumpeter, or violinist if they play any other instruments, they will likely tell you the story of how they started out on the piano and then branched out to their main instrument. Why is that? What makes the piano such a good foundation for further musical study? One of the main reasons for its ubiquitous nature is that the piano provides everything to the musician in an easily understandable, sequential order. When the 5-year old, who is just beginning to show interest in music by humming their favorite tunes or banging out rhythms on pots and pans, is brought to their first piano lesson, they are shown a keyboard that is arrayed from left to right in alphabetical order. There are no frets to consider, no valves to learn. 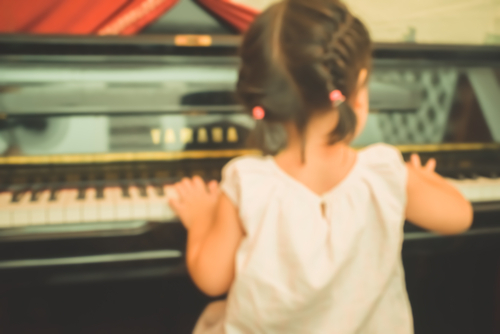 This doesn’t mean the young child can’t learn the right combination of motor skills to achieve the note they want using different frets or valves- the piano just eliminates one of the steps in creating that sound. In one sense, the piano is also a very easy instrument to play. If you press your finger down on a key, it immediately sounds like a piano. The same is not necessarily true if you picked up a violin or a flute for the first time and tried to produce a sound. Once again, this doesn’t mean that the beginning student can’t learn how to navigate their new instrument- the piano just eliminates the potential frustration of not being able to instantly create a pleasing, recognizable tone. Another good reason to begin your musical career at the piano is that it helps solidify your understanding of musical structure. The pianist routinely plays both melody and harmony- it is a chordal instrument, allowing the music student to become acquainted with musical progressions in a way that a single line instrument might not emphasize. The piano might not be your instrument of choice, but it certainly provides a well-rounded foundation from which to begin any course of musical study.